Combine the black-eyed peas, rice, tomato, green onions, celery, and parsley in a mixing bowl. Whisk together the lemon juice, oil, garlic, and salt in a small bowl. Pour over the salad and toss gently until evenly distributed. If time permits, chill for 1 to 2 hours before serving to allow the flavors to blend. 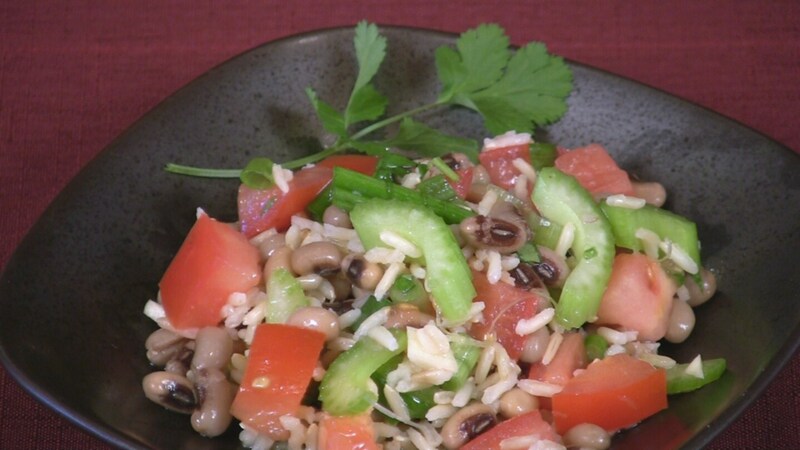 Stored in a covered container in the refrigerator, leftover Hoppin’ John Salad will keep for up to 3 days. If cooking the beans from scratch, see Bean Cooking Chart for details. See the Grain Cooking Chart for times for cooking rice. You could use diced red onion in place of the green onion.